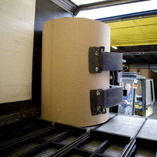 Outbound logistics refers to the same for goods going out of a business. GREEN DART is a Transportation Solution Company, offering services both on the inbound (supply side) and outbound (distribution) components of the total supply chain. We provide competitive pricing and a simplified process, coordinating all aspects from pickup to delivery. M/S. Green Dart Logistics Pvt. Ltd.
We bring in smooth planning and collaboration to regulate effective functioning of transportation services.